One of the mainstays of computer gaming over the years has been translating board games to videogame form. Boardgames are a popular pasttime in their own right, and their constrained playspace and (hopefully) unambiguous rules are a nice change for the developer: there’s a whole class of game design and balance issues that you just don’t have to worry about. It’s all about implementation. 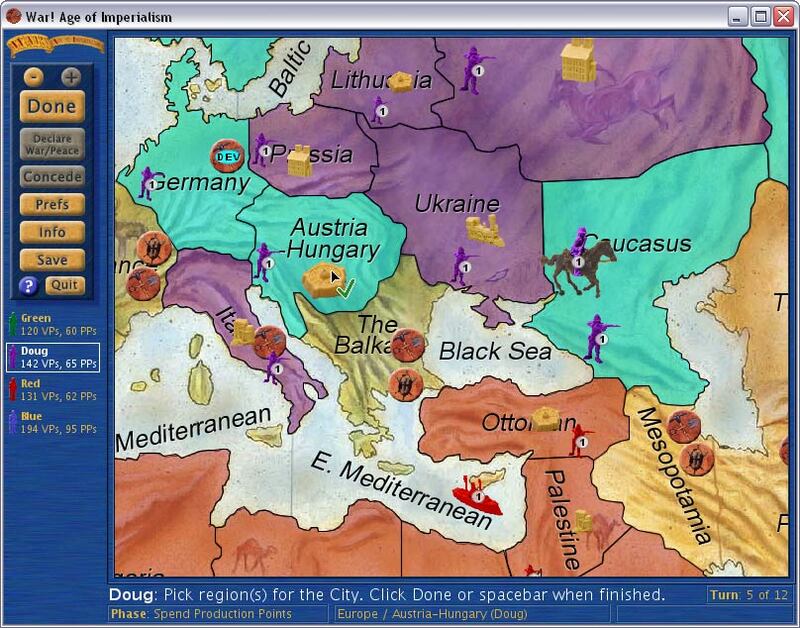 One of the more popular games for translation is the simple and addictive wargame Risk. There are innumerable versions of this game for every possible platform. Today, I’d like to talk about two new games that fall in to this class. Lux is Sillysoft’s faithful implementation of Risk, and it runs on Mac, Windows, and Linux. War! Age of Imperialism is not a Risk translation, but a translation of Eagle Games’ board game of the same name. Its conquer-the-world nature makes it close enough to Risk that I’m comfortable discussing it in the same review. War also runs on the Mac, Windows, and Linux platforms. Actually, I’d like to make one brief digression before I start looking at these games. Last April, in my review of President Forever, I asked why so few developers used SDL to produce multi-platform games. It seemed like a no- brainer to me. A number of readers discussed some of the drawbacks of SDL, and it made for interesting reading. This year, I would estimate that almost half of the games in the Independent Games Festival are multiplatform (not always via SDL; War and Lux are both written in Java). This is a dramatic sea change, and one that I hope represents the start of a trend, rather than the crest of one. Let’s start with Lux. I begin with a warning: Lux is simply a Risk clone. If you like Risk, you’ll like Lux. If you don’t, you won’t. So given the preponderance of free Risk games, why would you pay $20 for this one? Well, it’s a very good implementation, and it has some features that most of the free games lack. There are a few things I liked about Lux. First, the computer opponents. The AI in most Risk games is terrible. Lux’s AI is very configurable, and the hard AIs are challenging, although they seem to be much better on the ‘standard’ map than on some of the variants. The maps are pretty, and as I’ve mentioned in previous articles, I’m a sucker for a good-looking map. The combat effects are nice and shiny; the game is very easy on the eyes. In addition to the maps that come with the game, there’s an active community that is developing unique maps to play on (I liked the Roman Empire map, personally, and the Middle Earth one looked like fun also). Another significant feature in Lux is online play. It used to be that playing any independently developed game online was an exercise in patience and typing in IP addresses; we live in a better world now. Just click “show network games,” and you’re presented a happy little list of games in progress that you can join. I had fun joining other people’s games just to kibbitz and watch. Lux’s demo lets you play full games on a small set of included maps for a few weeks, so you can really get a sense of the game. You can’t use the plugin manager to install other maps, but if you connect to an online game using a map you don’t have, the game magically installs it for you. That’s a nice touch. I liked Lux. If you like Risk, it might be worth $20 to you. War! Age of Imperialism is a more serious game than Lux. The game is more slowly paced than Risk, which is not in and of itself a vice. Unlike that simpler game, whose primary mechanism is “plop down a huge number of armies and sweep across the board,” movement in War is more deliberate. During each movement phase (there are two per turn), you can attack at most one province per army. This assumes that your army can reach the province in question, and if you want to survive it’s in your best interest to attack a single province with more than one army (in a nice touch, you get a “combined arms” bonus for attacking with combinations of infantry, cavalry, and artillery). These limits make conquest – at least in the early part of the game – a far more gradual process. However, military force is not the only mechanism you have at your disposal. You can dispatch special “explorer” units in to neutral territory to try to convert the natives. Depending on the resistance they encounter, this will often be a cheaper path to success, and will leave the province’s resources intact for exploitation. 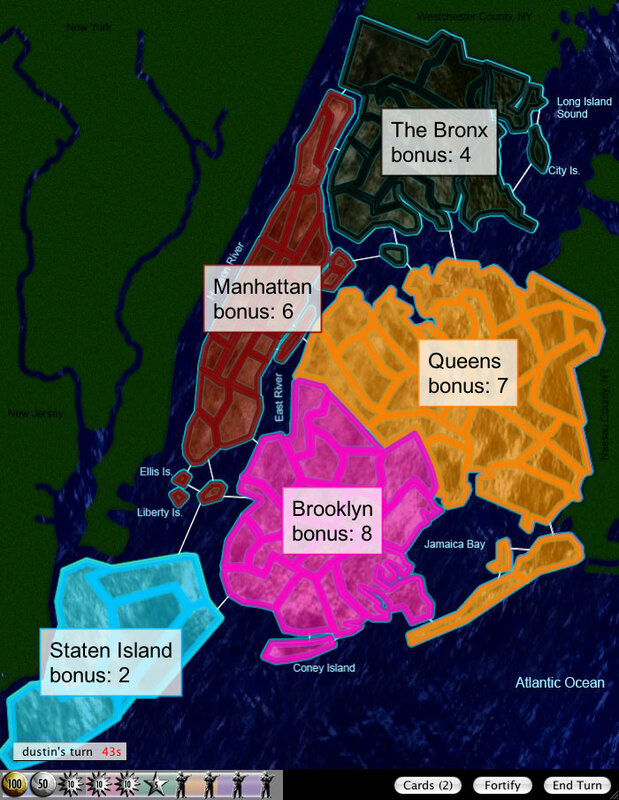 Resources, once exploited, serve to generate resource points, which can in turn be used to buy military units, or cities, schools, factories, and other structures. Lastly, there is a technology tree that may be researched which can have dramatic effects on your empire’s fortunes. Unfortunately, not all of the slowdown is due to the game mechanics imposed by the board game. The game has quite a few phases. In a very understandable attempt to be helpful, the application pops up dialogue boxes at the start of each phase, explaining what it is, and what it’s for. So far, so good. The dialogue boxes even have a “click here if you don’t want to see this message again” box. Even better. Unfortunately, if you’re playing against the computer, the game will display each of those boxes once for each player in the game. Which was enough to drive me absolutely insane. It’s clear that the developers are targeting the online market more than the standalone player, so it wouldn’t surprise me if the single-player demo wasn’t as much of a concern to them. But it was still a letdown. Also unfortunately, the demo only lets you play the first seven turns of the game against the computer. This is enough to get the feel of the game, but not actually enough to understand the strategies that are likely to be successful in the long haul. In my short 7 turn games, I had the best luck when I completely ignored all of the complex economy and industrial rules and simply sent a combined-arms strike team rampaging across the continent. Which kind of turns the game into Risk. Maybe that strategy would prove flawed in a real game against real opponents, but without a more substantial demo, I have no way of knowing. This ties in to a conversation I was having with an independent developer earlier this week. Figuring out the right amount of time and features to put into a demo is tricky. Put in too little, and users don’t buy the game because they aren’t sure if they like it. Put in too much, and users don’t buy the game because they don’t have to. It seems to me that figuring out where to draw the line on the demo might, in fact, be the single most important marketing decision an independent game developer can make. Indie game week may have ended, but I still have more games to review, and so I will be extending it until I am satisfied. Next week, look forward to reviews of The Lost Admiral Returns, Avencast, and Gate 88. See you on the other side of Sunday. You can download Lux here, for Mac, PC or Linux.